I'm so tired. I'm supposed to be doing a talk this Tuesday for my lab. Last time I did a talk, it took a week to prepare. This one took half of Friday and all of Monday (it was a long Monday). All the graphics are really fiddly. Plus, I have to work on Adobe Photoshop (on a Mac! The horror! ;) and I do know people say good things about it, but I'm afraid it irritates me. Three things especially; one, no capture function (see the first image linked below, which I captured using PSP). Two, stupid text options. Three, non-intuitive layer organisation. I spent all day, nearly, trying to get it to work. This evening, I sat down with Pen at a friend's house and fixed up today's strip, Thursday's strip and a good chunk of the next page of the First Story (teaser image below), all within three hours. So I will continue to be irritated with Photoshop. It gives me something to whinge about. The images I worked on: here is an image of a web page produced by the BLAST engine. 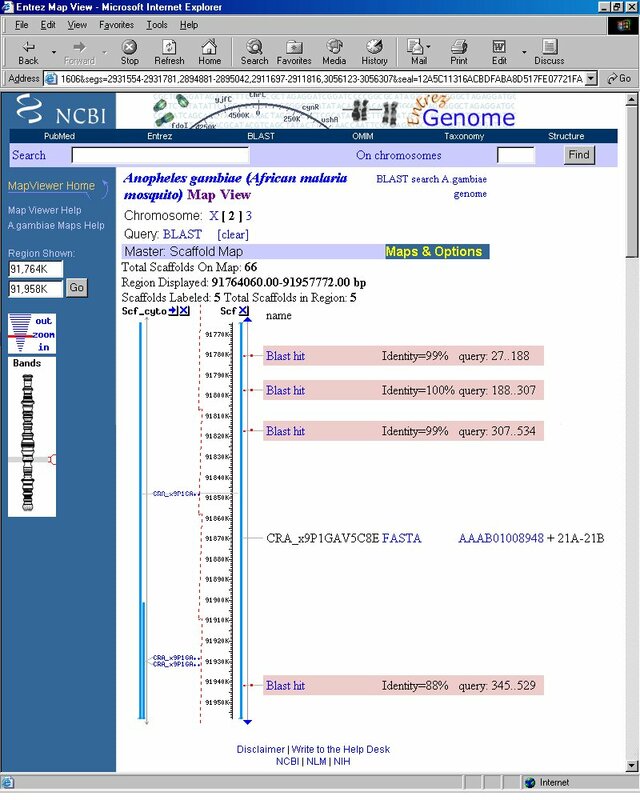 BLAST is a wonderful service - you enter a sequence of DNA or amino acids and it returns similar sequences from within its database (it's more than just a perl-script - there's some specific detail in matching certain pairs in sequences). Since it has a fair number of genomes (including my oh-so-beloved Anopheles), and it also has a number of individual genes from not-yet-fully-sequenced beasties, it provides a very valuable resource. 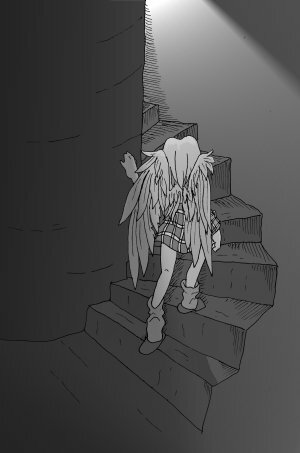 Here is an image from the second page of the third chapter of the First Story. It is in fact the next image in the sequence. I haven't finished the page yet, but I was quite pleased with how the image turned out.